Pakistani Rear Adm. Zafar Mahmood Abbasi, left, passes a ceremonial scroll to Royal Australian Navy Commodore Gregory Sammut, right, during a Chnage of Command Ceremony for Combined Task Force 150, as Royal Navy Commodore Tim Fraser, centre, looks on. The Royal Australian Navy today assumed command of Combined Task Force 150 (CTF-150).Rear Admiral Zafar Mahmood Abbasi SI(M) of the Pakistan Navy was relieved by Commodore Gregory Sammut of the Royal Australian Navy (RAN). The ceremony concluded the Pakistan Navy’s fourth successful command of CTF-150. 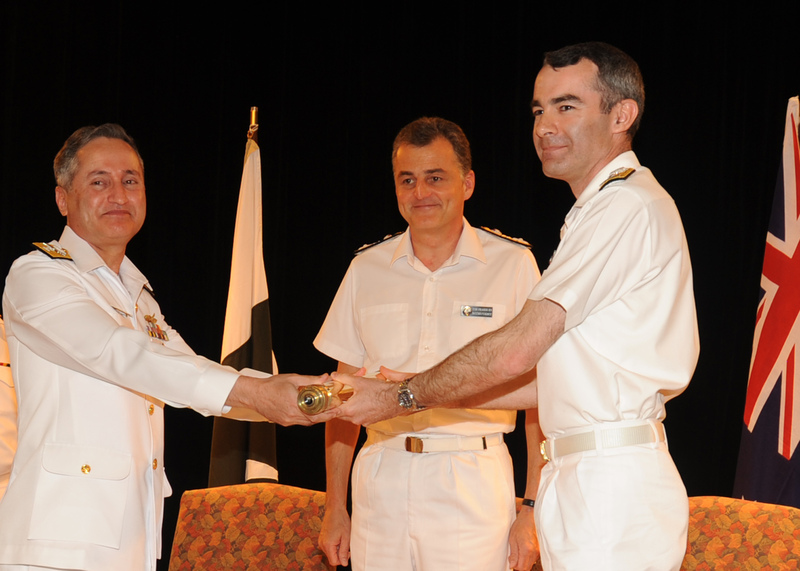 During his six month command tenure, Rear Admiral Abbasi commanded a range of ships from CMF member nations, including Australia, France, Pakistan, United Kingdom and the U.S. The admiral also visited a number of littoral countries including Saudi Arabia, Oman, Yemen and Jordon to strengthen relations with CTF-150.